Acax.eu - Liverpool Biennial 2010. The exhibition Touched is the result of a curatorial collaboration between the six curators each of whom developed their own approach to the question as to how art moves us, and then selected artists whose work moved them in this way. Touched will be presented across multiple venues: Tate Liverpool, the Bluecoat, FACT (Foundation for Art & Creative Technology), A Foundation and Open Eye Gallery, with half the exhibition sited in public spaces across the city. Lorenzo Fusi, curator of the current International Exhibition, was invited to Budapest for a curatorial research trip in the frame of the ACAX Check in Budapest visitor program in September 2009. 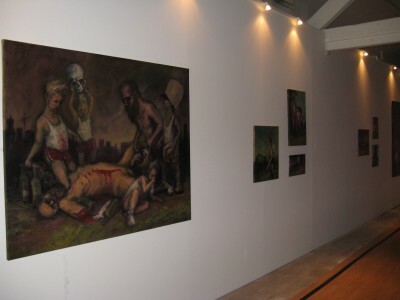 Following his visit he invited two Hungarian artists - Emese Benczúr and Csaba Kis Róka - to participate in the Biennial. Emese Benczúr first expressed her concern for the future, as a person and artist, in 1997 when she repeatedly embroidered the sentence “I think about the future” along strips of fabric where the phrase “day by day” had been previously woven. 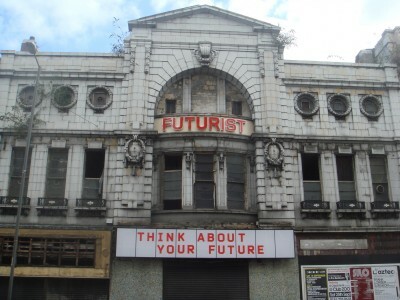 Similarly, for the 2010 Liverpool Biennial, the artist invites the viewer to ”think about the future”. The project has been inspired by the remnants of a disused cinema, formerly known as The Futurist. Csaba Kis Róka is one of the 8 invited artists to exhibit at THE HUMAN STAIN section of Touched, curated by Lorenzo Fusi. Csaba Kis Róka explores the innermost corners of the collective subconscious, delving into the realm of the unexpressed, and blatantly opposing political correctness. Playing with a rich pictorial texture that densely coagulates on his canvases, the artist stages traditional genre scenes imbued with irony, cruelty, abuse and random violence. Kis Róka’s paintings analyse the effects of trauma, social stigmatisation and political repression, and address the conditioning of the individual psyche by the system.